Today I was reading about Nehemiah getting all the leaders, priests & people of Jerusalem to sign a covenant (Neh 9 v 38 f.). My mind went back to accounts I had read of the Scottish Covenantors in 1638. 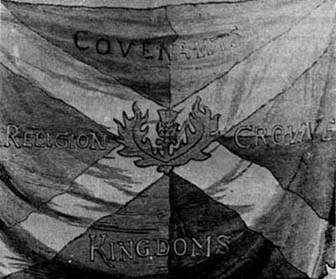 The Scottish people had been supportive to the Stuart King ascent to the throne in England only to find out that they started to interfere with the church. "These Kings not only believed that God wished them to be the infallible rulers of their kingdom - they also believed that they were the spiritual heads of the Church of Scotland." So on the 28th February 1938 in Greyfriars Kirkyard a group of people from all walks of life, noblemen, shopkeepers, clergy, farmers and the like gathered together to make and sign a covenant that said they saw Jesus as head of His Church not a human King. Some signed it in their own blood some shouted "until death". In the years following they were thrown out of their churches and hunted down by the kings troops as they held meeting in crofts and fields across Scotland. This was no easy promise or pledge. For many it cost them their lives. For me today church and going to church is all too easy it costs little more than time. We have buildings, technology, sound systems, video and flashing lights. If some one was to take all this away would I sign a covenant unto death?